At the first sign of a mouse inside a house, action must be taken right away. Giving them time to get comfortable and breed can lead to even bigger problems that can no longer be handled by an amateur. There are various ways to get rid of a mouse infestation at home, but one that is tried, tested, and proven to be effective is the classic snap trap. Although today there are more variations to the classic spring-snapping mousetraps we are used to seeing in hardware stores, they still function the same way. Place the bait, set the traps strategically, and wait until it lures the rodents in and—snap! Today there are now durable, easy to clean, and easier to reuse mousetraps made of plastic, and one such mouse trap is the Kat Sense Rat Trap. This review will cover this specific mousetrap pros, cons, and different unique features to allow you to make a wise purchasing decision. After this review you can determine whether this mousetrap is worth it to try catching the pests that are currently plaguing your home. The Kat Sense Rat Traps are great for people who want to avoid accidentally triggering the old-school snap-spring traps. The unique design of this rat trap makes it easy to set without worry about injuring your own fingers. The plastic material, together with its locking mechanism, makes it really easy to use with no worries. The trigger is also very sensitive once it is locked in place so that rats do not get the chance to eat the bait and run away before getting trapped. Once they are trapped, the stainless steel spring with the secure seize instantly delivers a clean killing blow. It has proven itself very effective in eliminating rats. Another big advantage of this rat trap is its plastic material. The plastic is easier to clean and disinfect because it does not absorb any blood, stains, and odor. This makes the rat trap very reusable without the fear of spreading disease. The bait cup is also a big plus for this rat trap because it attracts mice and rats due to the smell of the bait, but does not give them full and immediate access. More often than not, they trigger the spring and get trapped before they can even reach the bait. This means you don’t have to worry about rats getting away with free food. This rat trap, although a kill trap, is also appreciated for delivering a quick death. The springs are very tight so that they kill the rats instantly, so they do not suffer. If this is your concern, this rat trap will definitely deliver a killing blow to reduce suffering and squirming. One of the main disadvantages of this rat trap is its sensitivity. Although great for catching rodents, it can sometimes be triggered while simply moving the trap to the desired location. To avoid having to constantly reset the trap, move it to the location first and then set it to avoid accidental triggers. There are sometimes manufacturing issues on sensitivity and the tightness of the spring, if you notice that the traps are triggered, the bait is missing, but no rats or mice were caught, you can call the manufacturer and they can assist you. Take note that you need to replace the bait and clean the trap often to increase the chances of catching a mouse. If you leave the trap too long, it will not work and you will be left with a mouse or rat running loose inside you home. 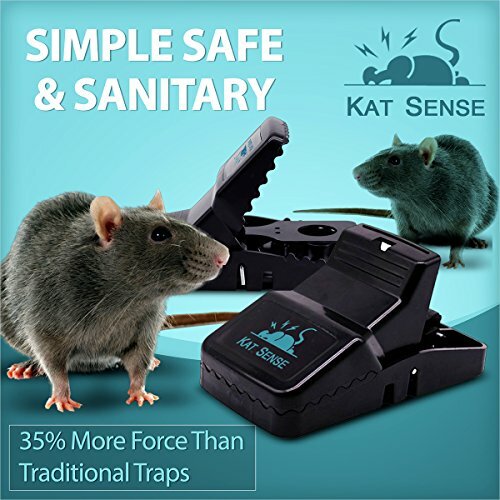 The Kat Sense Rat Traps works for many people. It is worth a try, but if it does not work for the first few nights, don’t give up. Strategize and keep trying until every last rodent is gone. • SAFE AND SANITARY PEST CONTROL: Free your home from unwanted pests and keep your household safe and sanitary with the best mouse trap in the market. Boasting a smart, integrated bait cup feature that allows you to place your chosen rat attractant or bait to lure the mice in, as well as an extra sturdy, polystyrene construction that promises to last for years to come without losing its efficiency, you can finally get the guaranteed rodent extermination results you have been asking for. • 100% RAT KILL RATE - NO ESCAPE: Forget about false triggers, stolen bait and escaping mice. 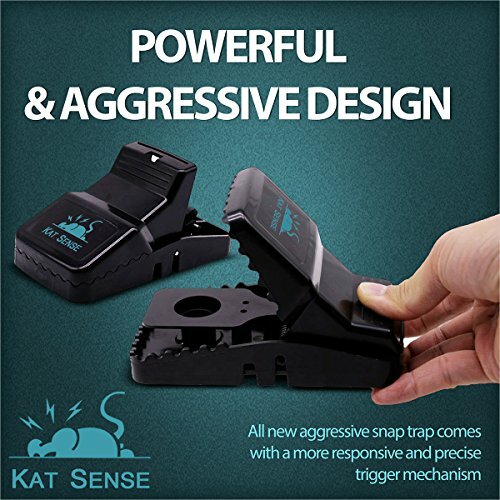 Kat Sense mouse traps feature a powerful, highly responsive snap mechanism with a sensitive pedal and specially designed teeth to guarantee a 100% kill rate, every time. 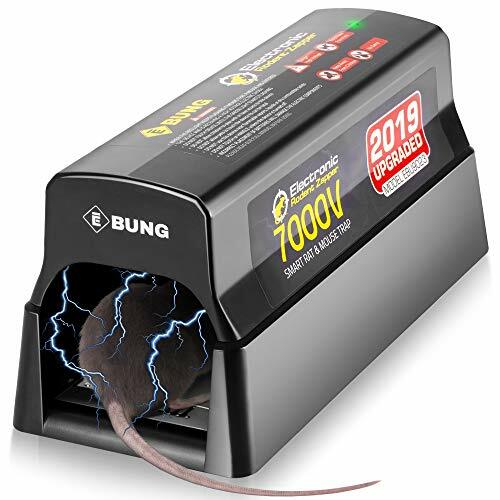 The improved, humane design ensures that rodents are killed fast and with as little pain as possible, while the bait cup can be easily removed, refilled and placed back into the mouse trap without having to set it first. 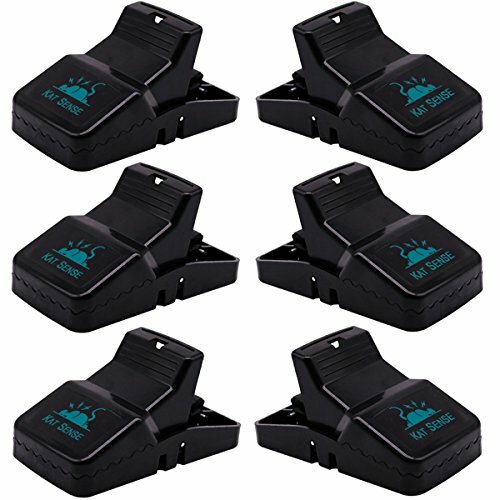 • EASY TO USE MULTIPLE TIMES: Unlike traditional, wood traps that are difficult to set and tend to leave foul odors and blood stains, these mouse traps are made of washable material for easy cleaning and removal of offensive odors from previous catches that can potentially alert mice to avoid the trap, making them a hygienic option for efficient rat extermination again and again. The trap can be easily pressed to open over a garbage bin for quick and hands-free disposal. • SET IT AND FORGET IT: Say goodbye to ineffective, pest control poisoning methods that leave dead, decomposing mice in your home structure. Place these mice killer traps alone or in pairs near baseboards, corners or in spaces, where rodents might hide and forget about them. Once the mouse triggers the trap, the high precision, stainless steel spring will hold it in place with 35% more force than other mice traps in the market, without breaking the skin, ensuring a mess free kill, every time.